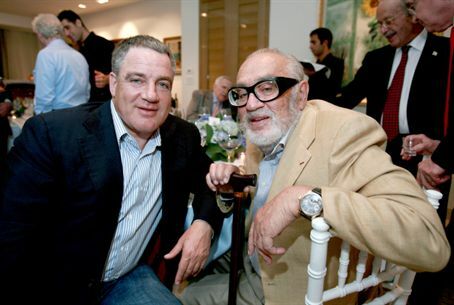 Millionaire businessman Sammy Ofer, 89, died at home. His company was the subject of controversy this week. Sammy Ofer, one of Israel's most successful businessmen, was found dead in his home on Friday morning at the age of 89. He had been suffering a serious illness. Among the businesses run by the Ofer group are the Tzim shipping company, the Mizrachi Tefachot bank, and various chemical plants. Ofer also owned the Zodiak shipping company and the Tanker Pacific shipping company. The latter company was at the center of a political and media storm in the past week due to accusations that ships owned by Tanker Pacific had docked in Iran. The United States slapped sanctions on the Ofer Brothers Group over suspicions that it had violated sanctions against trade with Iran. Allegations surfaced according to which Zodiak ships had docked in Iran as well. The Knesset's Finance Committee held a session to discuss the affair on Tuesday, but the meeting was suddenly stopped by chairman MK Carmel Shama (Likud) after Shama received a note, the contents of which he refused to divulge. On Wednesday, former Mossad head Meir Dagan stood up for the Ofer Brothers Group, saying, “There is no law saying you cannot dock in Iran.” On Sunday the Ministerial Committee on Legislation will consider a proposal by Shama to penalize companies that have ties with Iran. In addition to his life as a businessman, Ofer was a member of the Haganah pre-state defense group and fought in World War II and in the War of Independence. He gave to many causes, and established a foundation for those in need of life-saving medicine. Ofer is survived by his wife Aviva, his sons Eyal and Idan, and eight grandchildren and great-grandchildren. Ofer's businesses will continue to be run as usual, the spokesman added.